by Alana May, M.S. & Branyon May, Ph.D. In 1961, the Soviet Union shocked the world by sending the first man into space, Yuri Gagarin. This was not only the first manned flight into space, but the first to orbit Earth. Since that time, more than 500 professional astronauts representing 40 countries have traveled into space as pilots, commanders, or crew members of manned spaceflight programs.1 The three countries from which these astronauts have been launched include the United States, Russia (previously the Soviet Union), and China. It is important to note for those who might consider conspiracy theories that over the years of space travel, the three countries providing the launch abilities have had tentative and even hostile relations. Yet, even though the over 40 countries who have sent astronauts into space disagree on politics, religion, and economics, their recognition of a spherical Earth that is able to be orbited and studied is consistent. Each of these countries has been fortunate enough to send select men and women to space as first-hand observers and scientists to gather data from above the Earth’s atmosphere. 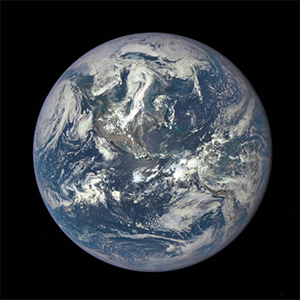 With more than 50 years of time and over 500 first-hand observers from over 40 countries, the view of Earth as a majestic globe has not been refuted or even brought into question by these individuals. While some may claim a Flat-Earth view, their arguments do not include spaceflight testimony from first-hand observers. While there are many amazing and beautiful images of our Earth provided by the National Aeronautics and Space Administration (NASA), we want to first focus on the photographic evidence available from numerous international sources. The following collection of photographic evidence only includes imagery from full-planet views of Earth. As you will see, the sources of these images come from a range of satellites, operated by different countries with sometimes different scientific objectives. Also the Japanese Aerospace Exploration Agency (JAXA) captured a full-disk view from the Hayabusa satellite.4 This satellite’s main mission was to study the comet Itokawa, but was able to image the full-disk of Earth from a distance of over 180,000 miles away. 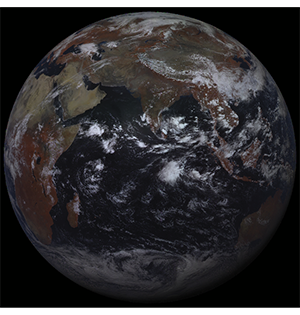 From India, we have photographic evidence from the INSAT-3D geostationary satellite, managed by the India Meteorological Department.7 Launched in 2013, this satellite is “designed for enhanced meteorological observations and monitoring of land and ocean surfaces for weather forecasting and disaster warning.”8 New full-disk images are regularly relayed to Earth approximately every half-hour. From China, we have photographic evidence from the unmanned Chinese lunar explorer Chang’e 5. Thetest module took this photograph on November 9, 2014 at a distance of 336,000 miles above the Earth’s surface.11 Notice the darker Moon (upper left) is clearly shown in contrast to the bright Earth. 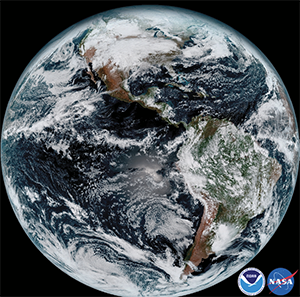 In 2015, the joint effort of the National Oceanic and Atmospheric Administration (NOAA), NASA, and the United States Air Force launched the Deep Space Climate Observatory (DSCOVR). Located one million miles away, this satellite “will maintain the nation’s real-time solar wind monitoring capabilities” in order to facilitate alerts and forecasts for geomagnetic storms caused by solar flares and coronal mass ejections.14 Different from geostationary satellites that continually maintain the same view of Earth, the DSCOVR satellite will be able to image all of Earth. Being located between the Sun and Earth, it will be able to watch the fully illuminated Earth rotate, imaging all sides of the spherical Earth. Many of us might remember feeling a bit shocked in grade school when our teacher announced, “Many scholars and aristocracy in the 15th century believed that the world was flat and that if you sailed far enough, you’d go right over the edge. And Christopher Columbus set out to prove them wrong.” The problem with this statement is that Christopher Columbus (and most people in the 15th century) did not believe in a flat Earth, but rather understood the world to be spherical. Even as we look back to the B.C. era, the accredited scientists of the day believed and were able to prove that the Earth was spherical. As far back as 500 B.C., most Greek scholars accepted the idea that Earth was spherical. Pythagoras (500 B.C.) 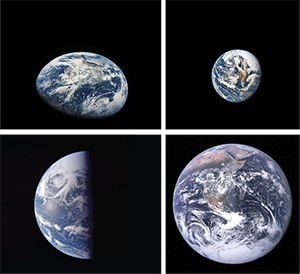 believed Earth was round for aesthetic reasons, because the sphere was thought to be the perfect shape. Aristotle (384-322 B.C.) was one of the first to make application of scientific observations to expected results, given a round Earth: (1) the hull of a ship disappearing over the horizon before the rest of the ship, and (2) Earth’s shadow being round during a lunar eclipse. Through time, ancient scientists would gain a deeper understanding of the physics of our world and begin to be able to explain what they were seeing in nature with mathematical formulas. While Eratosthenes’ method and calculations were somewhat crude, one can see the simplicity and significance that his calculations have provided to the scientific community. It is notable that the belief, investigation, and calculation of Earth’s shape and size predate modern efforts, such as those of NASA, by thousands of years. In this day and age of readily available information, sometimes just enough “truth” can be given to allow an idea to be plausible and believable in one’s mind. Sometimes an idea is given more credence because a celebrity endorses it. Other times, it might take hold because of a rebellion against the norm and someone wanting to be considered a “free-thinker.” Whatever the reason a person has for believing something, its source needs to have credibility and must be backed by provable, validated data—evidence. While the origin of the recent interest in Flat-Earth ideas may not be fully known or pinpointed, we can see that a spherical Earth is the one that has the scientific backing. While we did not consider many other evidences of the Earth’s spherical nature, such as Earth’s magnetic poles, GPS triangulation and satellites, the Coriolis effect, time zones, distant horizon curvature, Arctic and Antarctic exploration, and circumnavigation, we were able to evaluate numerous easily accessible observations. From our assessment of the shapes of other celestial bodies, observations of the Sun and Moon, consideration of historical perspectives, and examination of modern, first-hand and photographic evidences, we can see for ourselves that the scientific data supports a spherical Earth. 1 “List of Astronauts by Name,” https://en.wikipedia.org/wiki/List_of_astronauts_by_name; “Timeline of Space Travel by Nationality,” https://en.wikipedia.org/wiki/Timeline_of_space_travel_by_nationality. 2 “Satellite Imagery” (2017), Japan Meteorological Agency, Otemachi, Chiyoda-ku, Tokyo 100-8122, Japan; Image shown: http://www.jma.go.jp/en/gms/smallc.html?area=6&element=1&time=201706270300. 3 “Meteorological Satellites,” Japan Meteorological Agency, http://www.jma.go.jp/jma/jma-eng/satellite/introduction/satobs.html. 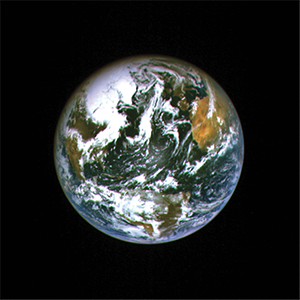 4 “The Earth Pictured by Hayabusa” (2004), Institute of Space and Astronautical Science, Japan Aerospace Exploration Agency, http://www.isas.jaxa.jp/e/snews/2004/0519_new.shtml. 5 Anatoly Zak (2016), “Russia to Introduce A New Generation of Spacecraft,” http://www.russianspaceweb.com/elektro.html. 6 “ELEKTRO Geostationary Hydrometeorological Spacecraft (In Operation)” (2011), Research Center for Earth Operative Monitoring, http://eng.ntsomz.ru/ks_dzz/satellites/complex_electro); Image shown: ftp://ftp.ntsomz.ru/ELECTRO_L_2/2017/May/24_05_2017/24052017_10%2030.jpg. 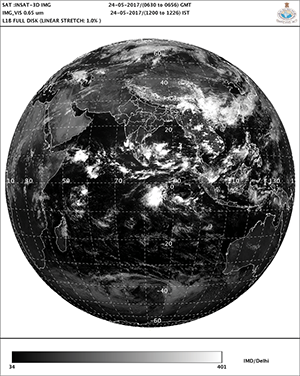 7 http://satellite.imd.gov.in/insat.htm; Image archive: http://satellite.imd.gov.in/archive/INSAT-3D-IMAGER/3D-FULL-DISK/. 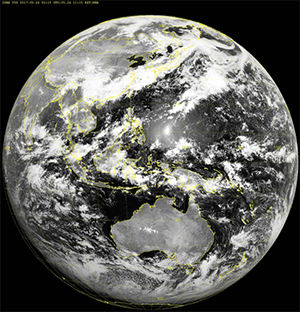 9 https://www.eumetsat.int/website/home/Satellites/CurrentSatellites/Meteosat/index.html; Image shown: http://oiswww.eumetsat.org/IPPS/html/MSGIODC/RGB/NATURALCOLOR/FULLRESOLUTION/. 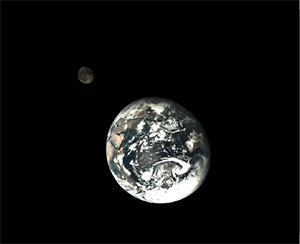 11 “Earth and the Moon from Chang’e 5 T1” (2017), The Planetary Society, http://www.planetary.org/multimedia/space-images/earth/earth-and-the-moon-from-change5t1-2.html. 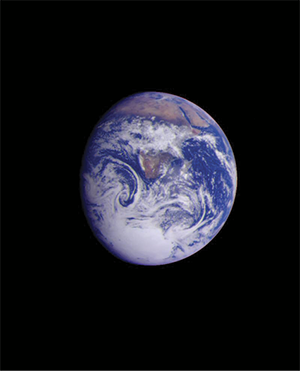 12 “Western Hemisphere” (2009), NASA, https://www.nasa.gov/mission_pages/apollo/40th/images/apollo_image_26.html; “May 18, 1969 - Apollo 10 View of the Earth” (2017), NASA, https://www.nasa.gov/image-feature/may-18-1969-apollo-10-view-of-the-earth; “View of Earth from Apollo 13,” Smithsonian National Air and Space Museum, https://airandspace.si.edu/multimedia-gallery/5429hjpg?id=5429; “Blue Marble - Image of the Earth from Apollo 17” (2007), NASA, https://www.nasa.gov/content/blue-marble-image-of-the-earth-from-apollo-17. 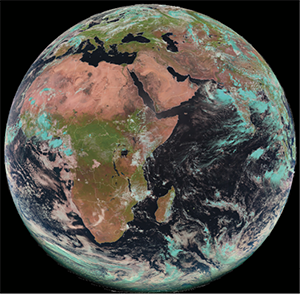 13 “PIA00076: Earth - Full Disk View of Africa” (1996), NASA/JPL, https://photojournal.jpl.nasa.gov/catalog/PIA00076. 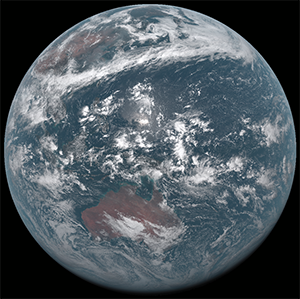 14 “DSCOVR: Deep Space Climate Observatory,” National Oceanic and Atmospheric Administration, https://www.nesdis.noaa.gov/content/dscovr-deep-space-climate-observatory; Image shown: https://earthobservatory.nasa.gov/IOTD//view.php?id=86257. 15 John Leslie and Connie Barclay (2016), “NOAA’s GOES-R Weather Satellite Readies for Historic Launch,” https://www.nesdis.noaa.gov/sites/default/files/asset/document/goes-r-l-30-press-release_oct6.pdf. 16 Alan Chodos, ed. (2006), “June, ca. 240 B.C. 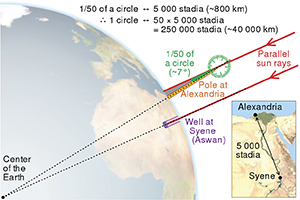 Eratosthenes Measures the Earth,” APS News, 15:2, June, https://www.aps.org/publications/apsnews/200606/history.cfm. wiki/File:Eratosthenes_measure_of_Earth_circumference.svg. 17 “Geodesy for the Layman” (1984), Defense Mapping Agency, http://earth-info.nga.mil/GandG/publications/geolay/TR80003A.html.